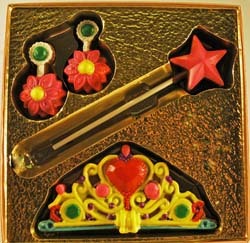 Handpainted Princess set comes complete with earings, crown and of course, a magic wand. Guarnteed to turn toads into princes. Well-- at least you can enjoy the chocolate untill he comes.